Adding a hot tub to your deck means adding extra weight onto it. So, a proper support plan is needed to accommodate the additional weight of the hot tub. The challenge is choosing from a wide variety of support plans and deck types available. Good thing there are online resources to help you with this project. All you need to do is understand how these things work and get the best option for your deck reinforcement needs. Before anything else, it’s important to estimate the deck load in order for you to determine how many support piers should be used. And if you want to incorporate floor joists, this estimate will also help you in calculating the required hot tub area. For instance, when you build and reinforce wood-frame deck as support system for your hot tub, you will need a specific floor joist and support pier estimation. In general, structural engineers are hired when it comes to this type of projects. They will visit your home and check the site where you plan to add a hot tub. Of course, you need to tell them what your exact plans are so they can suggest or improve the planning. Careful design makes any construction project simpler and more durable. The expertise provided by designers can deliver quality results and satisfying actual design after the implementation of the project. Since there is a need for close attention to the structural details, you need the experts to do it for you. This project is not advisable as DIY because of the crucial requirements needed in the deck’s overall design. Clear planning on how the deck should be reinforced for the new construction of a hot tub will create a high-quality upgrade. That means, you save money, time, and energy from a vague planning due to incapacity to man the project. Deck builders and designers are the key people who can help implement your deck construction needs in a timely fashion. In addition, they know how to carry out the plan and achieve exactly what you need. When it comes to structural support, they also understand which materials and type of deck to use so it fits your requirements while meeting your budget. 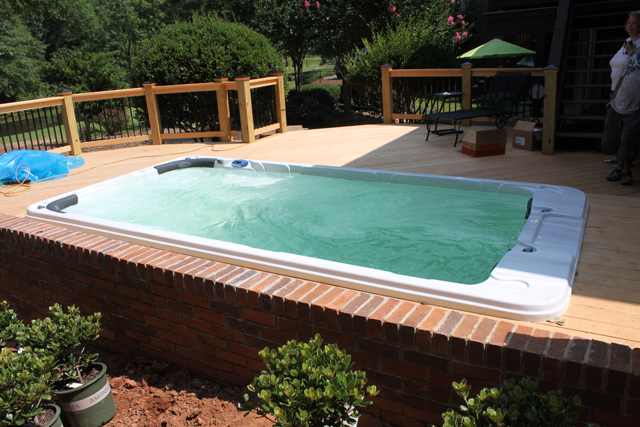 Normally, hot tubs require flat and even surfaces like a deck or concrete slab without any wedges. Aside from that, design and structural decisions must be based on the specific type of hot tub to be installed. One tip for this is to decide on which hot tub to use before you even start consulting the experts for the installation process. This way, you can determine the area needed according to the dry weight, dimensions, suggested occupancy, and water capacity of your hot tub. After determining the framing or slab weight, you can now proceed to the construction or installation. Ground-level tubs generally would need 3 1/2 inches concrete slab. However, larger tubs may need thicker slab for sufficient support. If your hot tub is going to be elevated, a specific framing is required to properly support it. And since the tub weight, occupants, and water may exceed to 100 pounds for every square foot, decks are created to support dead and live loads of 50 pounds for every square foot. First things first. You need to discuss the project with your chosen structural engineer in the area. These people will help you estimate the required tub area and support system for the deck. Also, with the help of an expert, you can determine how much support is needed for your deck so the hot tub will be properly accommodated. Architects or engineers might recommend additional joists for the existing joists in order to create a stronger support for the tub. They might also advise you to incorporate additional ledger board fastener. Additional beams can be added by knocking out the nailed blocks on the deck. Another step is to add the ledger board fastener to the current deck ledger. Your deck might only have one fastener and multiples are needed to support the weight of you hot tub. Then you need to place new joists against the existing ones for extra support. Using a clamp, you can hold the joists before you fasten them together. Plus, you may also add joists to equally distribute the load of your new hot tub on the deck. At this point, you fasten the joists together with the help of deck screws. Make sure that all the fasteners are tightly locked. Add joist hangers on the side so that additional support is given between the ledger and the joist. Lastly, nail back all the blocks which you removed before installing the new support components and tub. You may modify the blocks since the joists were added on them. ​Quality hot tubs can typically last for about 15 years. However, if you want to lessen the need to repair leaks and handle other problems, maintenance work is needed. Usually, manufacturers define the minimum required amount of pumps or plumbing to avoid complications. Once the hot tub is secured on the deck, it’s not hard to incorporate removable or hinged access panels on the sides. ​When your tub is recessed on the deck, you can create a frame so the access hatch is fitted to the access panel. This will provide you with enough space for performing the required maintenance. You can also leave enough space on your tub area so it’s easy to repair when there are problems or leaks. 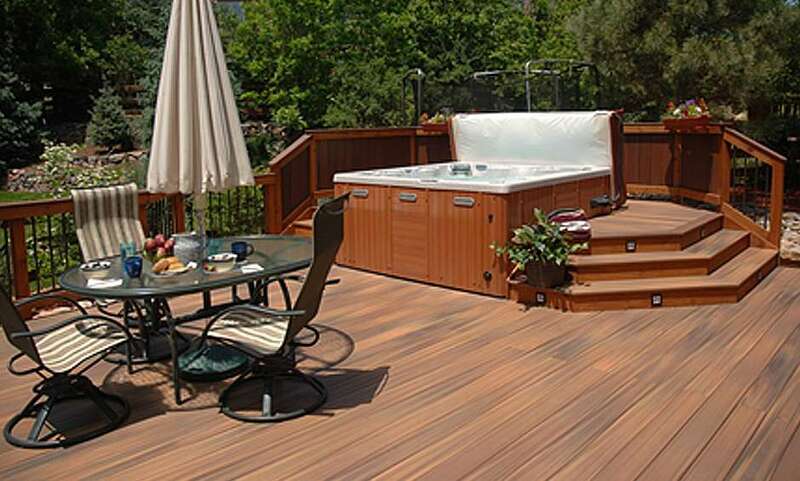 Overall, these are the ultimate tips you need in reinforcing your deck for your new hot tub. Now, you can enjoy and refresh in your home spa without the hassles of going out for a spa service.